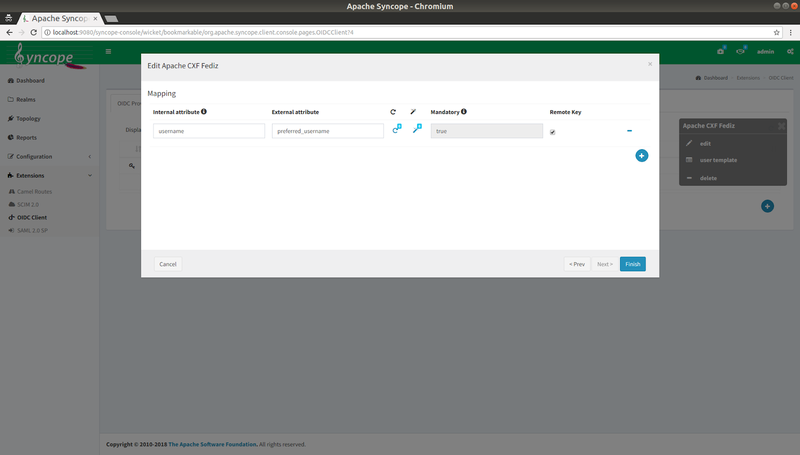 Apache Syncope is a powerful open source Identity Management project at the Apache Software Foundation. Last year I wrote a blog entry about how to log in to the Syncope admin and end-user web consoles using SAML SSO, showing how it works using Apache CXF Fediz as the SAML SSO IdP. 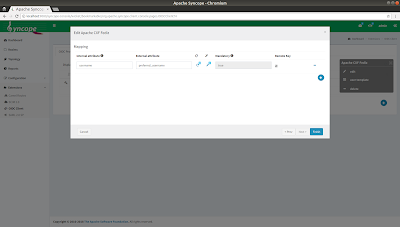 In addition to SAML SSO, Apache Syncope supports logging in using OpenId Connect from version 2.0.9. In this post we will show how to configure this using the docker image for Apache CXF Fediz that we covered recently. where "idp-ssl-trust.jks" is available with the docker configuration for Fediz here. Start the embedded Apache Tomcat instance and then open a web browser and navigate to "http://localhost:9080/syncope-console", logging in as "admin" and "password". Now log out and select the "Open Id Connect" dialogue that should have appeared. You will be redirected to the Apache CXF Fediz OIDC IdP for authentication and then redirected back to Apache Syncope, where you will be automatically logged in as the user "alice". SAML SSO support was added to the Apache CXF Fediz IdP in version 1.3.0. In addition, SAML SSO support was added to the Tomcat 8 plugin from the 1.4.4 release. However, unlike for the WS-Federation protocol, support was not included for SAML SSO logout. That's going to change from the next 1.4.5 release. In this post we will cover how logout works in general for both protocols, across both the IdP and Relying Party (RP) plugins. Follow the previous post I wrote about experimenting with Apache CXF Fediz in docker and start the Fediz IdP and the 'fedizhelloworld' application (supporting WS-Federation and not SAML SSO) in docker. Login to the 'fedizhelloworld' application (and to the IdP) by navigating to 'https://localhost:8443/fedizhelloworld/secure/fedservlet' in a browser and logging on with credentials of 'alice'/'ecila'. We can log out directly to the IdP by navigating to 'https://localhost:10001/fediz-idp/federation?wa=wsignout1.0'. As our IdpEntity configuration in 'entities-realma.xml' has the property "rpSingleSignOutConfirmation" set to "true", a sign out confirmation page is displayed asking us if we want to log out from the 'fedizhelloworld' application. If we click on the "Logout" button then what happens next depends on whether we supplied a "wreply" parameter or not. If no parameter is supplied then a successful logout page is shown at the IdP. Otherwise we have the option of supplying a "wreply" parameter to return to the RP application after logout is successful. For this to work, the IdPEntity configuration bean must have the property "automaticRedirectToRpAfterLogout" set to "true". In addition, the "wreply" address must match a regular expression supplied by the "logoutEndpointConstraint" property of the matching "ApplicationEntity" bean for 'fedizhelloworld'. After checking the Signature and doing some validation on the request (e.g. 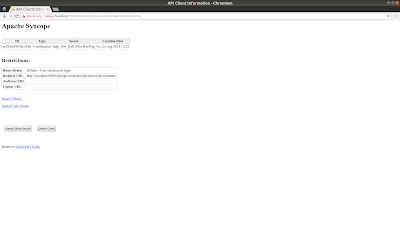 checking the destination), then a sign out confirmation page is displayed as per the WS-Federation case above (if the property "rpSingleSignOutConfirmation" set to "true). Once the user clicks on "Logout" then either a logout page is displayed on the IdP, or else a LogoutResponse is returned to the client (if the property "automaticRedirectToRpAfterLogout" set to "true"). In addition, the URL to redirect back to must be specified in the 'ApplicationEntity' configuration in "entities-realma.xml" under the property "logoutEndpoint". Specify a "wa=wsignout1.0" query parameter. This logs the user out and redirects to the IdP to log the user out there. Specify a "wa=wsignoutcleanup1.0" query parameter. This logs the user out and either redirects to a URL supplied by the "wreply" parameter (which must match the configuration item "logoutRedirectTo" or "logoutRedirectToConstraint"), or alternatively to the "logoutRedirectTo" configuration item if no "wreply" parameter is specified. If the URL matches the configuration item "logoutURL". The default behaviour here is to log the user out and redirect to the IdP to log the user out there as well. Feel free to experiment with these options with 'fedizhelloworld'. Support was added for SAML SSO logout support in the Tomcat plugin for the forthcoming 1.4.5 release. If the user navigates to the logout URL configured in fediz_config.xml ("logoutURL") then the user is logged out and a 'LogoutRequest' is sent to the IdP. If a 'LogoutResponse' is received from the IdP then it is processed and the user is redirected to the page specified in the "logoutRedirectTo" configuration item afterwards. Now log on to the RP via 'https://localhost:8443/fedizhelloworld/secure/fedservlet' and log out via 'https://localhost:8443/fedizhelloworld/secure/logout'. You will be logged out of both the RP and the IdP and redirected to a landing page on the RP side.